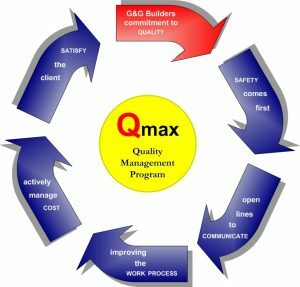 Qmax Quality Management Program G&G Builders implemented the Qmax Quality Management Program to assure that each of our projects are managed in a consistent format to deliver a top quality product. Qmax is a total management system that involves the entire project team, moving in the same direction to achieve a common goal. A team of specific G&G employees were selected to serve as part of the Qmax Quality Management Leadership Team. This group meets on a regular basis to discuss and implement practices that make our project run more efficiently. We take Quality Management seriously and communicate it often to our team. Our goal is a successful project and we work to achieve that success at all times. G&G Builders is committed to deliver a culture of quality, utilizing our history of construction experience, while focusing on continuous improvement.